Home Travel Dive Travel Diving Indonesia’s Macro & Megafauna – Which is Best? Sponsored Post - Whether it’s ocean giants or tiny critters, Indonesia has something for every diver...but which do you prefer? Appreciating the little and large things in life is important and the same can be said for scuba diving. Whilst diving with manta rays and sharks is thrilling, are some of the best animals also the smallest? Go Indonesia diving and decide for yourself, immersing in a world of tiny critters and ocean giants. Where Can You Dive in Indonesia? Lembeh Strait, the ‘muck diving capital of the world’, has over 60 dive sites and a whole myriad of macro creatures in the black sands. Here you can find endemic cardinal fish, mandarin fish, pygmy seahorses, stonefish and ghost pipefish. Bali liveaboard diving also offers fantastic dive sites, with the muck diving at Seraya Secret offering numerous macro critters. Encounters with Mola mola in Bali are not to be missed by megafauna fans. The Banda Sea and Komodo scuba diving also offer a variety of world-class dive sites, with muck diving, mantas, sharks and more. Why Go Diving in Raja Ampat? Those who go Raja Ampat scuba diving will never be disappointed. With over 530 different corals and 1500 species of fish, these waters will intrigue and fascinate even the most seasoned diver. Are Raja Ampat dives going to suit my taste? This is not really a question you need to ask yourself when planning your Raja Ampat dive trip. There is something for everyone. Whether you like big or small, dense numbers or unusual individuals, pristine hard corals or colourful soft corals you will find what you are looking for. Mantas are the big megafauna draw at Raja Ampat. If you see these gentle giants you will likely spend your dive close to these highly sociable rays. The amazing dive site Manta Sandy is one of the top spots to see them. Mobula rays are also commonly sighted throughout. Sharks will certainly feature in your Raja Ampat dives. 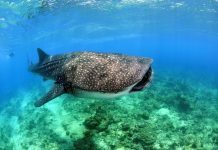 There are the famous friendly whale sharks of Cenderawasih Bay, endemic epaulette or ‘walking sharks’, weird wobbegongs and hunting black and whitetip sharks. For the macro enthusiasts there are frogfish, pipefish, blue-ringed octopus, pygmy seahorses and nudibranchs to enjoy. You will also likely find new gobies, blennies and anthias during your dives. The best time to focus on macro life is during night dives – when your field of vision focuses and allows smaller creatures to come into sight. Be sure to check out the southern area of Misool; an area particularly famed for the incredible soft corals and macro treasures hidden within. There are also pristine reefs of hard and soft corals, plus dazzling schooling fish at Raja Ampat. If you keep your mind open to seeing something new then you won’t be disappointed wherever you dive. The diverse marine life and pristine corals are enough to take even the most experienced diver’s breath away. Add to that a range of luxurious liveaboards to choose from, such as the Mikumba 2, and you’ve created liveaboard diving paradise. 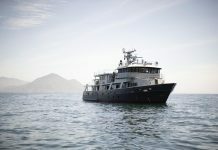 The Mikumba 2 liveaboard offers barefoot luxury Indonesia cruises; exploring the best of Raja Ampat and beyond. 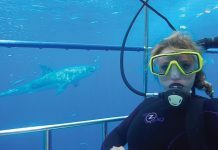 Previous articleScuba Diver Medical Q&A: Can you dive after using Sudafed?